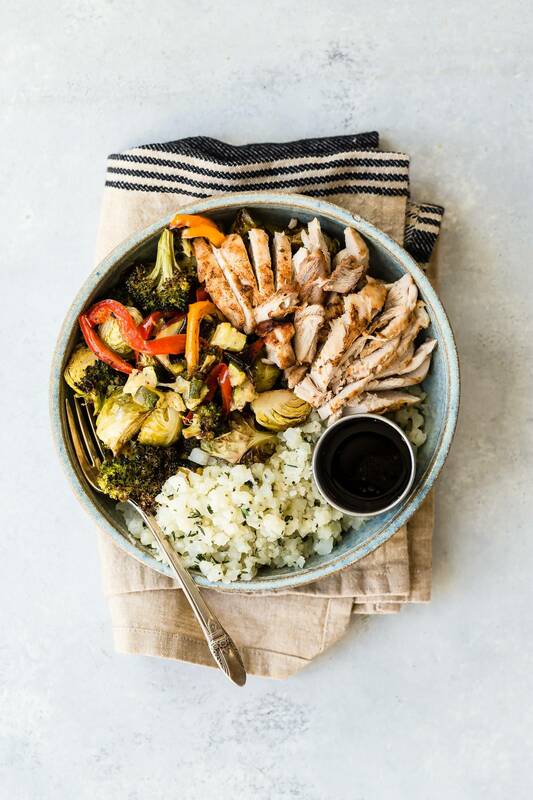 A super healthy and low carb Chicken Bowl, loaded with roasted vegetables and cauliflower rice. I’ve fallen more and more in love with cauliflower rice since it started becoming popular. 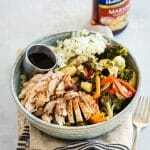 The fact that it’s low carb and keto friendly makes it more of an easy choice over regular brown rice. And more and more stores are carrying it already prepared so all you have to do is throw it in a pan, add some fresh herbs and a squirt of fresh lime juice and you’re ready to make it a full meal. And that’s what I did with this. The faux rice is topped (heavily) with a mixture of roasted vegetables, I used broccoli, peppers, zucchini and brussels sprouts, but you could easily use others if you prefer. Cooking the chicken for my chicken bowl! Usually, I always buy chicken breasts but I totally think it’s true when people tell me that chicken thighs have way more flavor. Buy boneless and skinless thighs and you’ll make the recipe so much easier too. I seared them in a really hot cast iron pan and finished them in a hot oven. But just before they hit the oven I gave the chicken thighs a generous splash of Holland House Marsala Cooking Wine. The chicken cooks fast but because we’re using thighs, they don’t dry out as quickly as chicken breasts and the marsala cooking wine also helps to keep them moist. As soon as they’re done, lay them on a cutting board and with a sharp knife roughly chop them into thin slices. 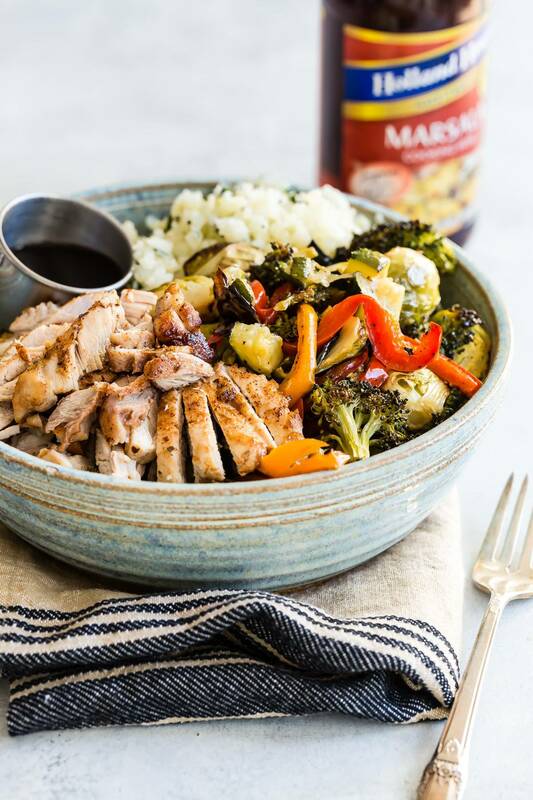 This recipe will easily feed two people and between the marsala flavored chicken and the sweetly caramelized veggies, this is one meal you’ll always be making! Place the broccoli, sliced peppers, brussels sprouts and zucchini on a large baking sheet pan lined with parchment paper. Bake in the oven for 20 minutes and then stir the veggies around a bit. Bake for another 10 minutes. Meanwhile, season the chicken thighs with salt and black pepper. Heat the remaining 2 tbsp olive oil in an oven-safe pan. Add the chicken and sear on one side for about 4 minutes. Turn the chicken over and add the marsala cooking wine. Place the pan in the oven. Roast the chicken for 15 minutes and it’s no longer pink in the middle. Combine the cauliflower rice, thyme and lime juice. 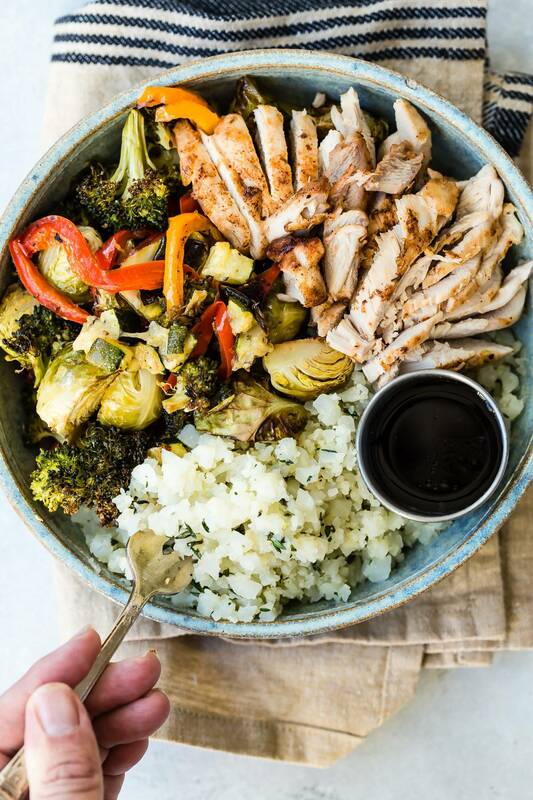 Arrange the cauliflower rice in a bowl along with some of the roasted veggies and sliced chicken. So so so delicious! :) My kind of dinner! Oh I haven’t made cauliflower rice in so long! I need to get back into it. And I think this big bowl is the perfect way to start. Looks amazing! I love this- can you please deliver!! This bowl is filled with everything I love! Bring it on! Healthy AND pretty?? This dinner is truly picture perfect! Guilt free yet still mouth watering! I love this for lunch or dinner, loaded with just about anything! 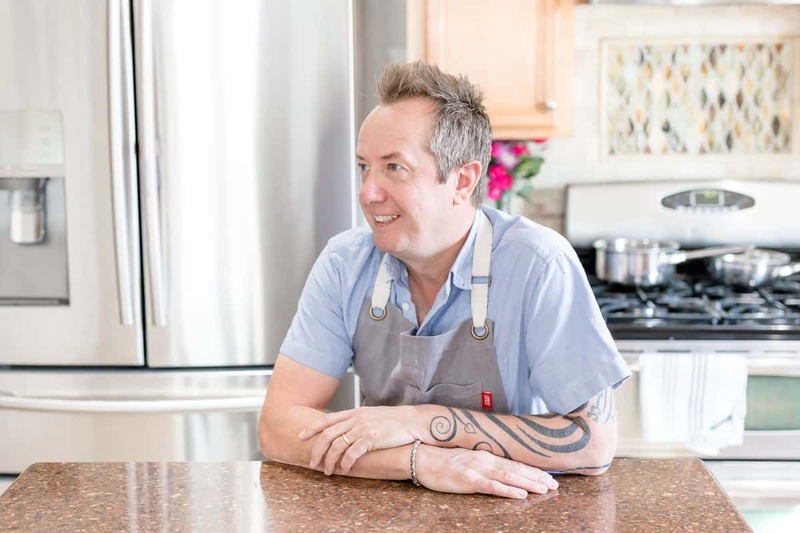 Great job on the low carb recipe, my friend! I love everything about this bowl! It took me awhile to get on board with cauliflower rice, but I’m completely smitten now.